While I was at the greatest wedding of all the times, I witnessed something miraculous. Something so mind boggling that my poor little brain could barely comprehend it. What was this amazing thing you ask? It was a balloon inside a balloon. As in, there was a white balloon, and inside of it, shaking around, was a blown-up red balloon. HOLY CRAP, am I right?! Christian and I had to harass some small children in order to find the creator of the balloon-inside-a-balloon. It was James' cousin and luckily for her this amazing talent she possesses canceled out the fact that she was the one who brought the dude who wore flip flops to a wedding. Yeah, that guy. And then, we decided that we needed to one-up this girl. So we set out to make a balloon inside a balloon . . . INSIDE A BALLOON. Bam, that's right. Three balloons. This turned out to be not so easy a task. Blowing up a balloon when it is stuck inside two other balloons is incredibly difficult. I have to give Christian most of the credit for the blowing up of said balloons, but I supervised. And then, finally, all we had left to do was to tie off the last balloon and . . . IT'S A BALLOON INSIDE A BALLOON INSIDE A BALLOON! I called the little one a balloon fetus. And then I ran around, forcing people to gaze upon our balloon creation. I don't think they cared. But the story doesn't stop there, oh no. As an aside, one of the many awesome things I do with my most awesome job ever is stabbing a balloon with a point stick without the balloon popping. Seriously. Balloon-kabob! And when I posted the above video on my Facebook, I was told that what would be really amazing would be if I stabbed a balloon inside a balloon inside a balloon--a "balloonception" if you will. 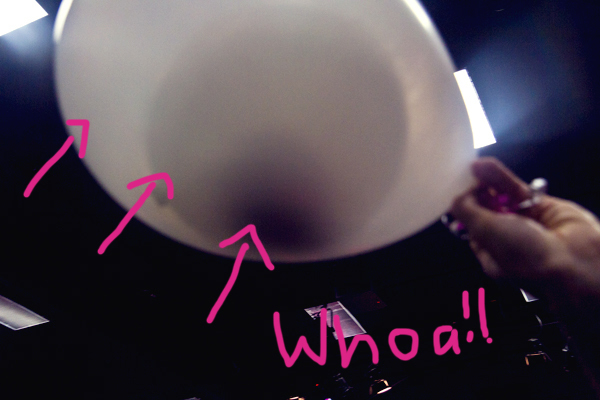 Also, while stabbing this balloon inside a balloon inside a balloon, I had to play Edith Piaf's "Je Ne Regrette Rien". Now, I realize this is just a balloon-inside-a-balloon-kabob, but I ran out of balloons and it was getting late and and the first two times I did it, my camera didn't record it properly and, honestly, I'd like to see you stab a balloon inside a balloon. So there.